Quite suddenly, a day can turn. Yesterday, for instance, I had planned a day of working around the house and recovering from the almost 12 inches of rain we had experienced during the past week. 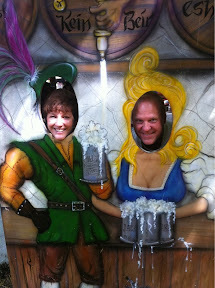 And then, in what seemed like only a moment, I was at the Maryland Renaissance Festival with Chris, Patrick and Tina. It turned out to be an exciting and interesting day. It had been about 10 years since I last visited the festival, and I remembered that I enjoyed it then. We started by renting some costumes to get in character. I was a knight and Chris a pretty maid--and she is pretty, too. There was plenty to do and to shop for. The number of people in character exceeded those who were just visiting--and the costumes were really very impressive. It was a lot of fun to look at the wide variety of costumes and the people wearing them during the day. It is a full day adventure with shows to see and many different things to experience. We even got the opportunity to experience some of the ambiance of medieval times as we toured the grounds and interacted with the vendors and actors. The king, Henry VIII was in attendance yesterday and of course was a curiosity wherever he went with his attendants. .
We had a fun day and I even tried on my first kilt--did't buy it, but tried it on for some fun. There is so much to do and see within the confines of the festival. I especially enjoyed the jousting events--they fascinate me and they were very well done. Entertainment was everywhere--and not in just the acts on the stages. Chris tried on some period clothes to see how they might help her to experience life in medieval times a bit more authentically. 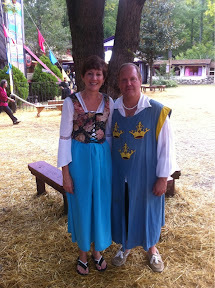 All in all, I highly recommend the Maryland Renaissance Festival--go check it out and have some fun. Plan a whole day and it is definitely suitable for children.